Sixteen years ago, my Hubby and I decided that I would be a Stay At Home Blended Mom (SAHBM). I never really saw myself as a Stay At Home Mom (SAHM), but having spent the first five years of Elle's life working full time along with a 50/50 custody arrangement the SAHBM idea sounded very appealing. I would have far more time available to spend with my Daughter on our scheduled days. My fantasy of having oodles of time to spend with Elle was thrown into a tailspin before I had one full week under my belt: my then 13 year old StepSon Chris came to live with us full time. Five very long years followed dealing with his deep emotional problems. Not surprising the bulk of them fell to me to handle - the SAHBM. I fantasized often about being able to walk out the door to a job and let someone else handle all the drama on the home front. The second-guessing of whether being a SAHBM was really worth it was a daily thought that ran through my head. Everyday that passed I felt as though the Lisa separate from Lisa the Wife, Mom and StepMom was ever so slowly disappearing. When Chris left our home, I was able to enjoy being a Stay At Home Mom to my three youngest. The countless memories I have shared with my kids are priceless. It doesn't mean that even with my fantasy SAHM scenario unfolding there haven't been some predictable pitfalls. The biggest one has been intermixing my kid’s accomplishments as my own. Trying to pick out an accomplishment from the past five years that belongs to me and only me feels like pulling teeth. As I write those very words here on this page, my own accomplishment jumps out at me - This Blog. Writing, sharing and communicating with other Mom's through my blog has been the accomplishment I was searching for. Life got a lot more interesting when I started blogging. I met other women who shared similar experiences to my own. As well as, meeting women with differing experiences who have brought an interesting perspective into my life. It was if the flickering light bulb above the staircase started to burn brightly. Engaging in adult conversation on a day-to-day basis was something I had let fall by the way side. Now I found the conversations intoxicating and with it I felt like a far more interesting and engaged person. Someone I was excited to introduce to my Hubby. The smile of Raylan's face said it all - the woman I had been years ago had reappeared in his life. When I looked in the mirror I saw me, not Mom to 1, StepMom to 5 or Wife to Raylan. I just saw Lisa and I liked it. 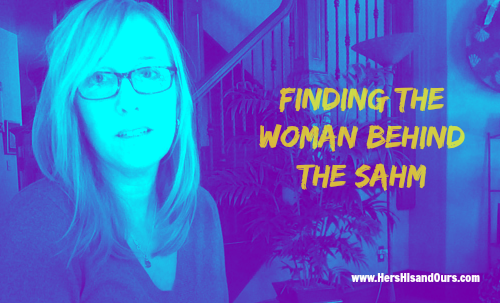 Finding LISA was finding the woman behind the SAHM to my kids I had left behind years ago. Any other SAHM -SAHBM out there who have struggled to find their own identity, separate from their kids? What has been your greatest accomplishment these past five years?